Sometimes in physics, certain phenomena are hypothesized long before they are directly observed. One famous (and timely) example is the Higgs Boson, which was first hypothesized in the 1964 and only tentatively observed a few weeks ago. Today’s paper describes a search for leftover signatures of another such phenomenon: pair-instability supernovae. Pair-instability supernovae are an unusual sub-class of stellar explosions which result from the core-collapse of massive stars. In order to understand what makes them unusual we first need to understand why the cores of massive stars collapse in the first place. Throughout a star’s life, its structure is defined by an intricate balance between gravity pulling inward and radiation pressure (due to photons produced during fusion) pushing out. If the pressure were to suddenly decrease, the core would no longer be able to support itself against gravity and would begin to collapse. In the case of “normal” core-collapse supernova this occurs after the star finishes fusing silicon into iron in its core, because at this point the creation of energy due to fusion ceases (fusion of elements more massive than iron actually requires energy). However, under certain special circumstances, more unusual physical processes can remove enough pressure to cause collapse. A pair-instability supernova is an example of one of these special cases. 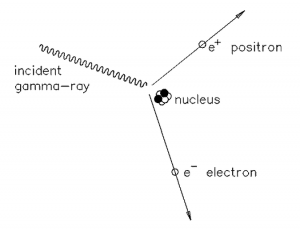 If a star is hot enough in its core, some of the gamma-rays produced during fusion will be so energetic that they can transform into an electron-positron pair (see figure, right). Because of Einstein’s E=mc2 law, only a photon with at least twice the rest mass energy of an electron can undergo this process. Because the photon doesn’t survive, pair production effectively removes radiation pressure, which can lead to core-collapse. Since the core temperature of a star is directly proportional to its mass, theorists predict pair-instability supernovae should only occur for stars with initial masses above ~140 solar masses. Very few stars formed today have masses this high, but many of the first generation of stars (Pop III) may have routinely formed at this mass and above. Although first theorized in the late 1960s, observational evidence for pair-instability supernova has been scarce. One possibility would be to attempt to identify the progenitor star to a supernova in pre-explosion images and determine if its mass was greater than ~100 solar masses. 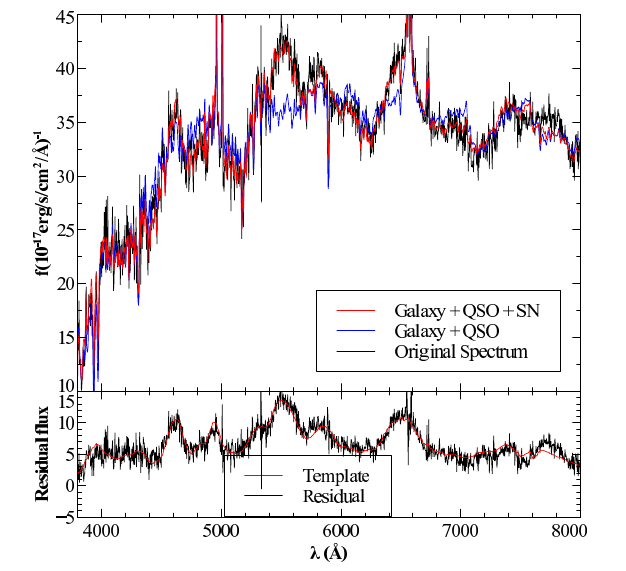 The recent supernova 2007bi was tentatively identified as a pair-instability event using a similar line of reasoning. Alternatively, if pair-instability supernovae were much more common during the time of Pop III stars, it may be possible to look for indications that Pop II stars (the second generation) were formed from gas that was enriched by a pair-instability supernova as opposed to a “normal” core-collapse. Because the explosions happen via different physical processes, slightly different element abundances are predicted as a result. Specifically, pair-instability supernovae are theorized to have an over abundance of elements with even atomic numbers (especially Calcium) and an under-abundance of elements with odd atomic numbers. The atomic number is denoted Z, so these elements are referred to as “even-Z” and “odd-Z” elements. It is this second approach which the authors of today’s paper decided to attempt. In order to identify Pop II stars that are candidates for enrichment by pair-instability supernovae, the authors decided to search for stars which are (1) relatively metal-poor and (2) show Calcium enrichment. The number of Pop II stars enriched is this way is expected to be low, so they conduct their search in a sample of 12,304 stars from the Sloan Digital Sky Survey (SDSS) Data Release 7, all of which possess relatively high signal to noise spectra. So, how did they determine which stars were metal-poor yet Calcium-rich? The authors utilized what I would call an interesting quirk in how astronomers measure the metal content of a given star. 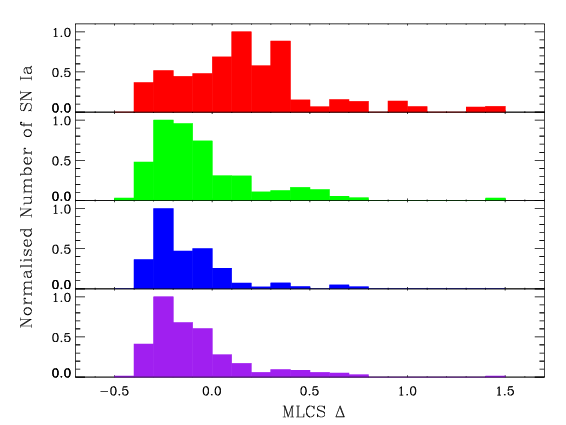 A comparison of two metallicity indicators for 17,000+ SDSS stars. The red points above the bulk of the sample are likely to be Calcium enhanced, and, hence may have been enriched by a pair-instability supernova. Metallicity is technically defined as fraction of matter in an astronomical object made up of elements other than hydrogen or helium. In practicality, however, astronomers will often measure a single element and use it as a proxy for the total metal content. 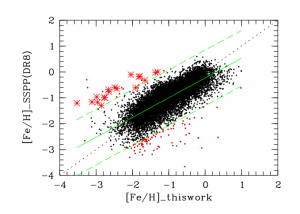 For stars, astronomers often use iron as a metallicity indicator, however, in low resolution spectra it is sometimes necessary to use two incredibly strong Ca II lines (the H and K lines) instead. Note that a relatively metal-poor star with a calcium enrichment whose metallicity is measured in this way will appear metal-rich rather than metal-poor. Thus, the authors measure the metallicity of the 12,000+ stars in their sample by two different means, one of which partially relies on calcium and one of which does not, and look for deviations between the two (see, right). In the end, the authors identify 19 candidate stars whose metallicities measured by the two methods differed by more than three sigma (the red stars in the figure) in the direction one would expect for calcium enrichment (and, hence, potential enrichment by a pair-instability supernova). This paper was the first in a series and focuses on their selection technique. In a following paper they will present much higher resolution spectra which will examine in more detail whether these 19 candidates are consistent with enrichment by pair-instability supernovae.